DRACMA one year after: Which changes have occurred in diagnosis and treatment of CMA in Italy? In 2008 the World Allergy Organization (WAO) verified that the existing guidelines on CMA were usually national position papers reflecting local views and needs, with flexible, sometimes evidence-based, strategies [1–4]. Then, a global guideline for IgE-mediated CMA from diagnosis to treatment was developed using the GRADE approach . We review here the first steps of Diagnosis and Rationale for Action Against Cow's Milk Allergy (DRACMA) together with the changes in diagnostic and therapeutic behavior generated by the new guideline. Challenges with the guideline development process include difficulties in synthesizing evidence on diagnostic tests and therapeutic indications, reconciliation of information obtained through different statistical methods, transparency in evaluation of diagnostic and therapeutic tools, adherence to the clinical questions to which a physician is confronted in real-life . In order to meet these needs, two panels were constituted in DRACMA: a clinical panel and a methodological GRADE revision panel . Three systematic reviews addressing the clinical questions were developed by the GRADE revision panel: 1-diagnosis, 2-use of substitute formulas and 3-immunotherapy for CMA. The GRADE evidence profiles for the clinical questions were developed on these systematic reviews. Summaries of evidence were reviewed by the panel members whose suggestions were incorporated. The quality of the evidence was classified as "high", "moderate", "low " or "very low" [6, 8–12]. Finally, the DRACMA guideline panel reviewed the evidence summaries and formulated "strong" or "conditional and/or weak" recommendations. The statements on the underlying values, preferences and remarks are integral parts of the recommendations, and serve to facilitate their accurate interpretation. DRACMA was first introduced at the 2009 Buenos Aires World Allergy Congress and in a dedicated Meeting in Milan in February 2010 . After the first publication in WAO Journal in April 2010, DRACMA was replicated in an indexed journal . The worldwide situation in diagnosis and treatment of CMA before DRACMA was described in a round table at the Milan Meeting . The subsequently published NIAID guidelines  widely referred to DRACMA, now cited by dozens. Of note, the method used has been indicated as an example of transparency in the development of guidelines and it has become a cornerstone for GRADE methodology [7, 8, 17–19]. A DRACMA implementation committee has been appointed at WAO in order to favour the diffusion of the guideline. Under its auspices, a GLORIA Module on DRACMA is being developed, national translations are being prepared and a dedicated page on WAO website is in preparation. From this, mobile and I-Pad applications developed by a volunteer copyrighted to WAO will be freely available. However, many reasons (availability of medical and nursing staff, hospitals resources, ability of families to reach reference centers, etc.) may make difficult performing an OFC at the outset. 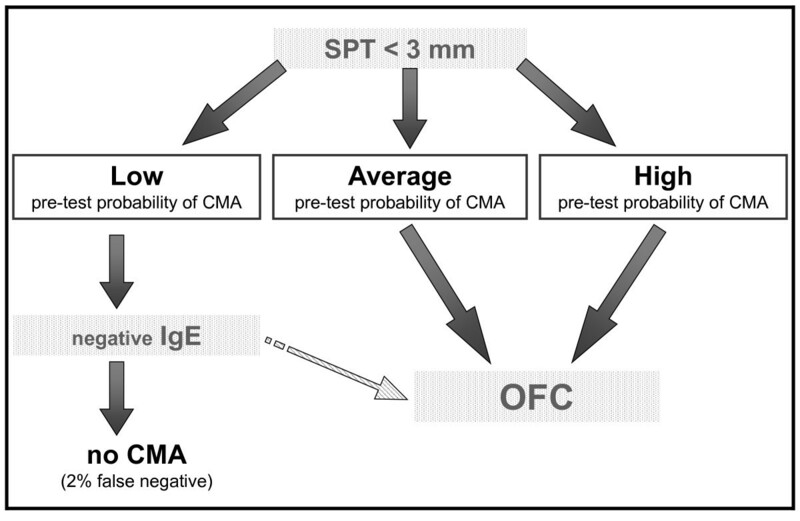 Thus, in selected cases, using a pretest probability estimate can offer an almost certain diagnosis simply by performing an SPT and/or specific IgE determination. The diagnosis would be "almost" certain because, as in any decision-making path, there is a small chance of false results. The guidelines indicate the price to pay to avoid performing OFC in all cases and keep it only for selected doubtful cases. The decision to use OFC in all cases (recommendation 1.1 and 2.1) or to recur to sensitization tests in some cases (recommendations 1.2, 1.3, 1.4, 2.2, 2.3, 2.4, 3 and 4)  should be taken at local level. Four simple patterns describe these decision processes (Figures 1, 2, 3 and 4). After a scientific review of all the papers available in the literature via the GRADE method, the DRACMA guidelines identified the cut off values for SPT and specific IgE determination results as 3 mm for wheal diameter in the SPT and 0.35 IU/L specific IgE to cow's milk using the CAP-RAST or FEIA method. In settings where OFC is not considered a requirement, should skin prick tests be used for the diagnosis of IgE-mediated cow's milk allergy?. In settings where OFC is not considered a requirement, should cow's milk-specific immunoglobulin E test be used for the diagnosis of IgE-mediated cow's milk allergy?. In settings where OFC is not considered a requirement, should in vitro specific IgE determination be used for the diagnosis of CMA in patients suspected of CMA and a positive result of a skin prick test?. 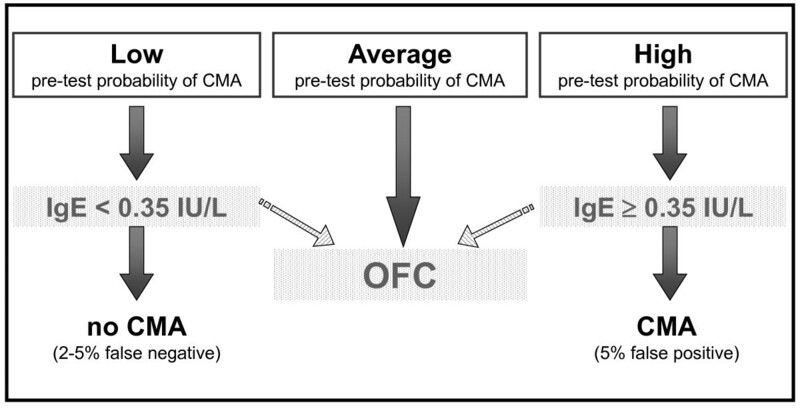 In settings where OFC is not considered a requirement, should in vitro specific IgE determination be used for the diagnosis of CMA in patients suspected of CMA and a negative result of a skin prick test?. 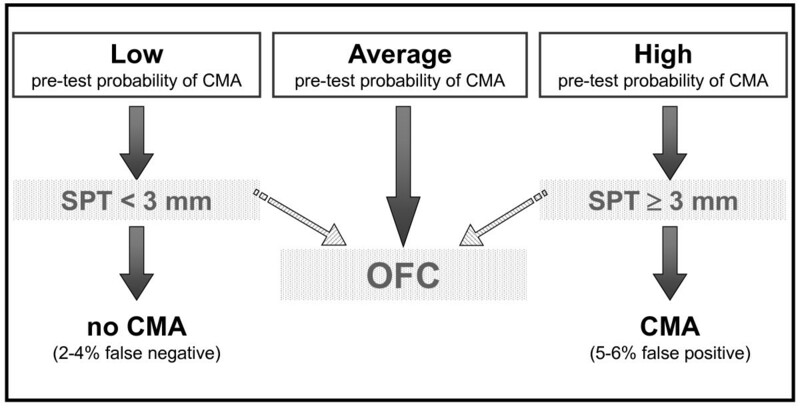 How DRACMA changes diagnostic attitudes in CMA? The DRACMA recommendations substantially modify the current practice in diagnosing CMA. Per their dictate, the diagnostic OFC performed under the supervision of a specialist remain the best diagnostic strategy, to be performed whenever available. This is so evident that in case OFC is performed out of a research setting, sensitization tests may not be necessary (recommendation 1.1). This is counterintuitive for pediatric allergists, as correct diagnosis of CMA, starting with a suspicion and ending with the OFC, traditionally passes through sensitization tests including SPT, atopy patch tests, and specific IgE determination. Despite the recommendations, it is current practice that these tests base clinical decisions. Thus, very often OFC is not part of the diagnostic workup and is only indicated after an elimination period of a few months or upon a specialist's advice in more severe cases. This exposes whole populations to overdiagnosis of CMA and to excessive use of elimination diets [20, 21]. However, there are whole regions in the world and even whole States in the USA where performing an OFC is impossible for practical reasons . In this case, DRACMA recommendations indicate that challenge may not be necessary in many cases. OFCs remain necessary in all cases of high uncertainty. This is also a revolutionary step in CMA diagnosis. The search for a replacement tests has been very active in the past years, a sort of philosopher's stone to avoid OFC whose practice is considered risky, resource- and time-consuming . Specific IgE cut-off points, SPT diameters and/or APT have been proposed as replacement tests. In DRACMA, the limits of these diagnostic practices are clearly indicated and their possible use is re-evaluated. 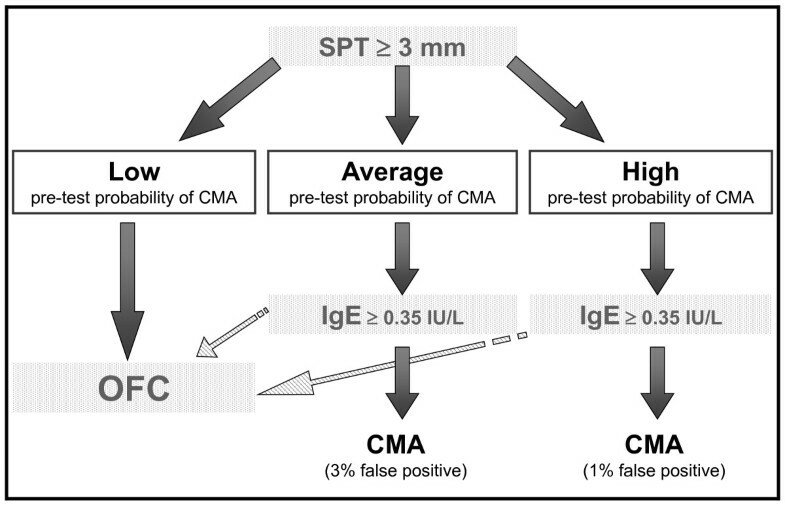 Atopy patch test is not considered useful in the diagnosis of IgE-mediated CMA and molecular diagnosis may be useful, but further data are necessary . ^AAF if a relatively high value on avoiding sensitization by SF and/or a low value on resource expenditure are placed. °SF if a relatively low value on avoiding sensitization by SF and/or a high value on resource expenditure are placed. **this suggestion attributes a high value on avoiding exposure to even residual antigenic cow's milk proteins. The DRACMA guidelines recommend that OIT be administered to patients with IgE-mediated CMA only within the context of formal clinical research to avoid serious adverse effects that negatively offset the increased probability of desensitization to milk. However, due to the rapidly growing literature, a new metanalysis will be produced shortly. Pediatric medicine is a science, not an art. In a field traditionally open to various interpretations, as CMA, DRACMA guidelines draw a definitive borderline between diagnostic possibilities, and a clear indication in the choice of the appropriate formula. The application of DRACMA recommendations to the Italian reality should favour the diffusion of the correct diagnostic practices in a context very rich of diagnostic facilities  but in need of standardization of the procedures . If correctly applied, they should also modify the composition of the special formulae market, avoiding unnecessary treatments.